Your growing kitty goes wild for pate, so give him the nutrition he craves with the Nutro Kitten Soft Loaf Chicken Recipe Grain-Free Canned Cat Food. Featuring real chicken as the first ingredient in a whisker-licking tender loaf, it provides plenty of protein for healthy muscles and yummy flavor for a satisfied tummy. Every bite is also packed with all the nutrients your pal needs to look and feel his best every day, like vitamins, minerals and essential taurine. Plus, it also provides plenty of moisture to help keep him hydrated and healthy from nose to tail! And with no grains, fillers or anything artificial, even sensitive kitties can enjoy. Kitten wet food recipe features real chicken as the first ingredient for the protein needed to support healthy, lean muscles. 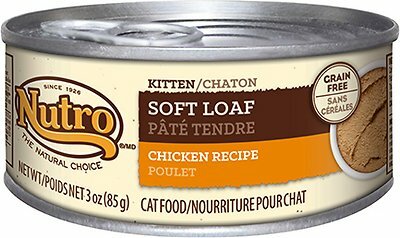 Soft, tender and highly-digestible loaf pate with smooth texture is perfectly lap-able and easy for kittens to eat. Chicken, Chicken Broth, Chicken Liver, Pork Broth, Natural Flavors, Guar Gum, Minerals (Calcium Carbonate, Potassium Chloride, Ferrous Sulfate, Zinc Oxide, Copper Proteinate, Manganese Sulfate, Sodium Selenite, Potassium Iodide), Sodium Phosphate, Fish Oil (Preserved with Mixed Tocopherols), Vitamins (Choline Chloride, Thiamine Mononitrate [Vitamin B1], Vitamin E Supplement, Niacin, D-Calcium Pantothenate, Pyridoxine Hydrochloride [Vitamin B6], Vitamin A Supplement, Vitamin D3 Supplement, Biotin, Vitamin B12 Supplement, Folic Acid), Salt, Taurine. Weaning to 6 months: Feed about 1/2 - 1 can daily per 1 lb body weight, served in 3 - 4 meals. 6 months to Adult: Feed about 1/2 - 1 can daily per 2 lb body weight, served in 2 meals. Pregnant: Feed 3 1/2 - 4 cans for 9 lb Adult cat daily. Lactating: Feed 5 - 6 1/2 cans for 9 lb Adult cat daily. Adjust food to maintain ideal body weight. Refrigerate unused portion for up to 3 days. Feed at room temperature. How do you read the code dates on NUTRO™ Biscuits and Treats? The code can be found on the top flap of our biscuit and treat packages. This is the “Best by" code date format. It is the first line and will appear like the following example:Best by 04 AUG 13 92 1First line: “Best by 04 AUG 13” means it’s best by August 4, 2013. “92 1” is the plant ID information.Second line: Contains manufacturing information, such as shift, line, time, etc. How do you read the code dates on NUTRO Dry Food? Our NUTRO Pet Food has a “Best by" code date stamped on the back of the package. It is the first line and will appear like the following example:Best by 24 APR 13 27 1First line: “Best by 24 APR 13” means it’s best by April 24, 2013. “27 1” is the plant ID information.Second line: Contains manufacturing information, such as shift, line, time, etc. How long has The Nutro Company been making natural pet food with added vitamins, minerals and other nutrients? We have been in business since 1926! Where is The Nutro Company located? Our headquarters is located in Franklin, Tenn., just outside of Nashville. We have 3 manufacturing facilities for NUTRO™ Products. 1 is located in Victorville, Calif.; another in Lebanon, Tenn; and the third facility is located in North Sioux City, S.D. Our GREENIES® Products are made in Kansas City, Mo. What is The Nutro Company nutrition philosophy? Pets First: At The Nutro Company, leading - edge knowledge and expertise in natural pet nutrition are the foundation of our work.Natural: We use natural ingredients in NUTRO Products. We believe natural foods are healthier, safer and tastier.Powerful Solutions: Every ingredient in our products is there for a reason: to deliver healthy, superior nutrition you can see.No Compromises: At The Nutro Company, we hold ourselves to a higher standard. It’s why we’re dedicated to pet food safety and quality. We offer complete satisfaction, guaranteed or your money back. What makes the quality and safety standards at The Nutro Company different? We produce our dry pet foods in our own facilities located right here in the United States. * All of our facilities adhere to industry - leading food safety and quality standards. * We have dedicated quality and sanitation experts in each of our facilities to ensure the quality and safety of our pet food. * We never operate for more than 7 days in our dry facilities without an in - depth cleaning and sanitation break. * We regularly conduct on - site audits at our ingredient suppliers to ensure that our quality and food safety standards are met. * We test our key ingredients before we use them to ensure nutritional and food safety parameters are met. * We test our shipments of grains for mycotoxins before we unload them to ensure they are safe. * We carefully test every finished product batch to confirm microbiological safety, nutritional compliance and shelf stability through oxidation testing before we ship it. * We lead the industry in our commitment to understand and drive stability and freshness of natural pet food.The Nutro Company was first to receive American Feed Industry Association (AFIA) Pet Food Manufacturing Facility Certification Program certificates for our 3 manufacturing facilities in Victorville, Calif.; Lebanon, Tenn.; and Kansas City, Mo. This achievement illustrates our commitment to pet - food safety. How does The Nutro Company test its products? Nobody invests more in pet food safety and quality than we do. We test every single batch of our key ingredients before we use it to ensure nutritional and food safety parameters are met. We test every shipment of grains for mycotoxins before we unload it to ensure it is safe. We carefully test every finished product batch to confirm microbiological safety, nutritional compliance and shelf stability before we ship it. The Nutro Company was recently the first company to receive the AFIA Facility Safety seal, which is a third - party pet - food - safety certification. Even though this is kitten food my older cats just love it. 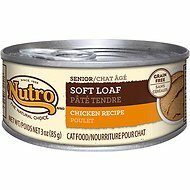 I have tried other brands of can cat food, but they prefer nutro kitten soft loaf chicken over all these other brands. I think one reason they like this kind so much is because it is so much like AD prescription can food that they really like,very smooth,mushy & yummy. I will keep buying. I got a new cat and she has been sick since day one. She refused to eat the dry food my breeder told me to get but will eat this food. I wish they had bigger size for this food. My another cat is used to like Nutro gain free duck and salmon canned food but I can’t find it anymore. 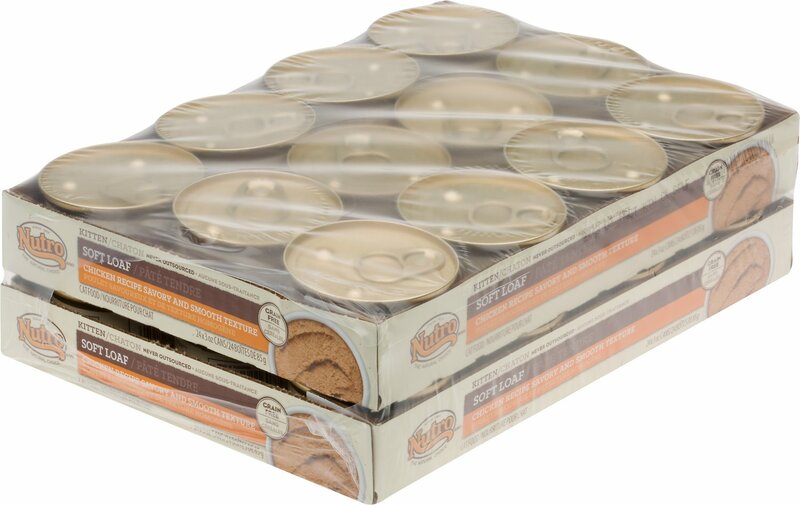 Overall, Nutro grain free canned food is a good quality food. My kitty loves this food!! My adult cat Milo is going through an incredibly picky phase right now. We've gone through every single food at Mud Bay and he wont touch any of it. We have to be careful what kind of food we give him because low quality cat food makes him incredibly sick. After researching for a bit we came across this and tried it and he absolutely loves it. My 3 older cats require moist, juicy food and they liked it very much. The mature (older) soft loaf was unavailable, so I bought this as a fill-in. My finicky little kitty who really prefers kibble eats this one all up. I like the moisture content as she doesn't seem to be a water drinker. All made in USA that is a BIG plus !! 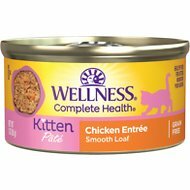 My kitten needs to be on a grain free chicken diet for her sensitive tummy, and this is one food that never makes her sick. Whenever I try another kind, she gives me sad eyes because she loves this one so much. My other cats seem to love her leftovers too. Best canned cat and kitten food out there! 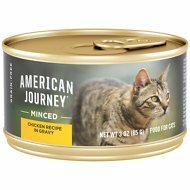 This canned food, even though for kittens, has the highest protein level. Cats are supposed to get high protein, so I am always searching and reading. This one fits the bill! I have a kitten but I also have an adult cat and I feed it to both. They both love it! It smells really yummy too. Alot of cat food doesn't. My adult cat is very finicky and needs lots of variety, but he gobbles this up every day and never gets tired of it. I just wish they had the soft loaf and the level of protein in turkey and salmon and some other meats and fish. They only have a limited selection and the salmon is lower in protein, go figure. I run a community cat program and all the kittens I get absolutely love this food! The smooth texture and yummy smell entices them every time! Best high protien kitten food! I have a Siberian Forest Cat who is pretty needy in his diet. No grains, high protien, no carrageenan. He is super picky and I have to rotate foods for variety all the time or he gets board. I pick two flavors per month. This flavor is hands down is absolute favorite. He has never gotten tired of it, and it is so good for him! No fish!! Happy kitty.